Efficacious facial treatment and an ideal beauty oil. 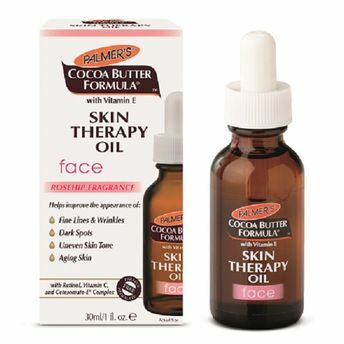 Palmer's Skin Therapy Oil is a multi-purpose, anti-aging skin perfection facial oil that targets aging skin and repairs damage - reduces lines & wrinkles. It moisturizes dry patches and lightens dark spots and rejuvenates skin. This non greasy skin therapy oil is non-staining formula that is easily spread and absorbs gently by skin. Another advantage of this oil is that it heals the old scars and damaged skin also. This product can be used all over the body and this lightweight formula has an exclusive blend of key ingredients. Palmer's skin therapy oil helps reduce Stretch Marks, fine lines and dryness and it is Dermatologically Tested and rich enough in Vitamin E, Pure Argan Oil, Natural Oils, Cetesomate-E Complex, Rosehip, Sesame and Canola Oil. After the regular use of 8 weeks fine lines and scars start lightning. This skin therapy oil is best solution for all skin concerns. Explore the entire range of Anti-Stretch Mark Creams available on Nykaa. Shop more Palmer's products here.You can browse through the complete world of Palmer's Anti-Stretch Mark Creams .